The AMRU-200 Telometer from Amperis is the only meter on the market that implements all measurement methods: measurement can be carried out using the 2, 3 or 4 pole technical method, using the impulse method (4 / 10μs, 8 / 20μs, 10 / 350μs), measurements by the double clamp method without the need to place auxiliary electrodes and allows to measure the resistivity of the soil, as well as a pulse test. 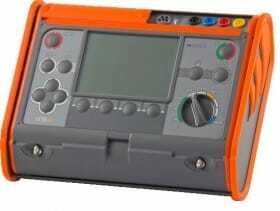 It is important to highlight the version of the equipment with built-in GPS: the AMRU-200-GPS. The measurement GPS coordinates are stored in the device's memory, later they can be transferred to the computer with the USB cable. The advantage of this equipment with integrated GPS is that all the measurements are geolocated, knowing the coordinates of them, which is very useful when many measurements are made. Earth contact test probe (rod); 0,30m - 4 pcs.